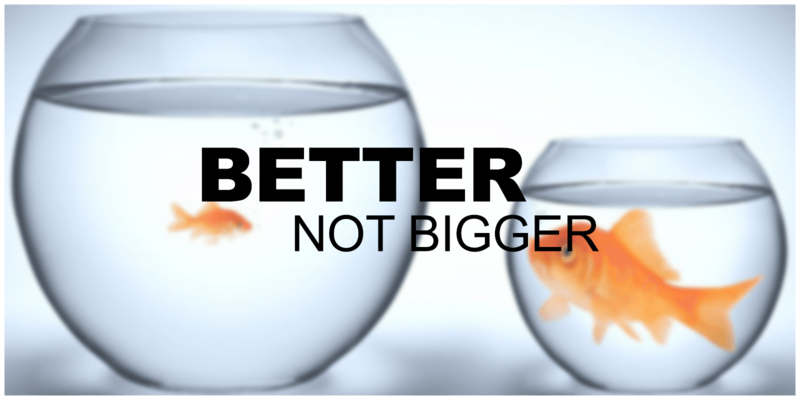 Are you operating under the assumption that bigger is always better? You’re not alone, but let’s take a minute to rethink what’s become a tired and ineffectual notion. Conventional business wisdom has long been grounded in the belief that if your business isn’t growing, it’s dying. Not true. In fact, growth for growth’s sake can wear a company thin, decreasing employee satisfaction and watering down customer benefits. Growth isn’t necessarily bad, but the idea that you must grow bigger is misguided. In fact, companies focused strictly on growth for growth’s sake create environments that require a nearly constant addition of new employees and new customers and an ever-growing pool of funds to bankroll the continual change. Now growing to be better–that’s a different story. Sure, profitability is a must. But the goal at AM Transport is to grow better not bigger. When we focus on value (better not bigger), we change the game! When we focus on value we offer to shippers, carriers, team members, and our community at large the benefits are huge. Better instead of bigger frees us from the burdens inherent in a growth-based strategy. Better not bigger results in big gains for our customers and carriers. Benefits that include highly trained and skilled team members who cooperate with one another to make sure you and your customers get the best service, robust technology, deeper resources, and inquisitive, autonomous decision-making. Let’s take a look at how AM Transport’s focus on better not bigger upends our hiring, on-boarding, and retention processes and what that looks like for our customers. Accomplished and highly-trained team members. Better not bigger means that we put our resources towards building a core team of superstars. We’re not churning staff like those companies chasing growth. In fact, we don’t have staff at all; we are a team of colleagues. We’re deliberate when we hire someone. We are looking for the right person with a positive mindset, a value-driven purpose, and exceptional talent. We don’t spend vast amounts of money to repeatedly on board and train large numbers of new staff knowing that many of them won’t be with us at year’s end. We expect new team members to stay, and because of that we direct extensive time and financial resources towards higher development. This means in-depth industry training for team members, additional resources for higher-level opportunities with the expectation of self-directed (with assistance) continued education. Our team members not only expect to be challenged, they flourish because they appreciate whole-hearted belief in their potential. Here at AM Transport, we understand our roles and the roles of our teammates. It might sound crazy, but the synergy is so good that often we can almost read each other’s minds. And here’s where cross-training comes in. We offer opportunities for individuals to work on a variety of projects. Learning all aspects of the business, as well as, the businesses of our customers and carriers keeps our team members from being pigeon-holed into single-thinking roles. Because our team members are not in direct competition, they can help each other by offering a variety of unique perspectives, thinking beyond transaction and towards long-term solutions. Team members with advanced decision-making skills. We practice open-book management and invest substantial time in financial training and transparency in all aspects of our company. This makes for a better-educated and well-informed team that gets the big picture and engages in smart decision-making based on intelligent and broad-based inquiry. In such an environment, decision-making is not only quick, studied, and consistent, but always based on the core belief that we do what’s right. Autonomous and inquisitive decision-making benefits not only us, but our customers and carriers as well. Retention translates into long-term team members who know your business. This sort of holistic hiring and training leads to greater retention. We don’t experience a rotating door here. Our team members have a strong purpose. They are a well-oiled and cohesive team that works in unison to service our carriers and our customers. Because they have long tenures, our team members trust each other which creates an environment where communication and understanding are the norm. Increased tenure (this is what you get when people are invested in relationships) translates into increased knowledge of customers and carriers. Building relationships means that we look at our work over longer time horizons. We get to know our customer and their suppliers. We get to know our carriers, their needs and their goals. Because we develop relationships meant to last, we take the time to find customers and carriers who are aligned with the way we want to do business, and this translates into higher levels of service and better satisfied customers and carriers. As you see, the focus on better not bigger completely changes the way we train and retain team members, but there’s so much more. We spend time getting to know you. We’re not focused on growing bigger, so we can afford to be more selective about our customer base. It’s a liberating way to work. We don’t waste time on new customers who don’t fit in order to fit some arbitrary volume quota. Instead we focus on finding the right customers and growing with them. Smart technology and excellent customer service! When we invest in technology, we do it with precision. We’re not trying to build systems simply to increase our multiples of worth. We invest in and build systems that provide value and service to our customers and carriers. At the same time, we realize that technology can’t solve every problem. That’s why we don’t believe in phone trees or voice mail. We make and stand by this promise–when you call us, you reach a live person on the other line, determined to help, listen, and get the job done. We’re financially independent and debt free! How does this help you, our customers? We’re not chasing rapid growth, so we operate on cash-flow. We’re not beholden to outside investors pushing us to hit those arbitrary growth numbers. Don’t get me wrong. We have goals, but they’re goals our team members agree upon. Growth for the sake of growth is a deficit-laden strategy because it’s based on a hollow premise–that growth is always good. Growth isn’t inherently bad, but it should be a result of good practices, solid relationships, and robust relationships. Better not bigger is a new way of doing business, and we’re in it for the long haul.